The ingredients are for the most part just what you would use to make the cake but without the fancy topping although in this case a little more carrot then is required. The oil is whisked with the eggs, bicarb and sugar to make a nice thick paste which by itself is pretty much guaranteed to meet anyones daily intake of energy. 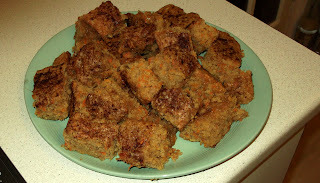 Once that is done blend in the flour which makes a serious gloup then add the grated carrot and give a damn good stir. Once everything was mixed together the resulting yumminess was poured into a lightly greased dish and then cooked for 30 minutes at 150degrees. The recipe was actually intended for microwaving but I've never really taken to cooking using that method so I went with the old tried and trusted. Now I'll be the first to admit the presentation of the final product lacks the sugary goodness of the walnut and iced topping but to me the little squares look delicious.